Created to be your best friend, climaSchutz protects you from wind, drizzle, light rain and cold. Ideally suited for training and or racing in changing and cooler weather conditions, use it to insulate your body on cool, damp early morning rides, long downhills and, of course, when exposed to light rain. climaSchutz protects from the outside, which also means that outbound moisture transfer is slowed. This happens regardless of the breathability of the wind/rainbreaker fabric. Consequently, we do not recommend using shells (regardless of brand) when riding very hard for long periods of time because the body will sweat more, dehydrate faster and, in the process, loose essential minerals. To minimize this effect, climaSchutz incorporates lateral air vents to accelerate evaporation and cool more effectively. The requirements in the technical briefing from the internal ASSOS Werksmannschaft to the ASSOS prototyping studio were simple to put on paper but difficult to put into production: “Give us the best of all worlds! Light weight, low volume, superior breathability, thermal insulation and good rain pro- tection. Oh, and while you’re at it, make the finished product transparent so we can quickly spot our teammates under inclement racing conditions.” The ASSOS design team did it! • AEPD — racingCut. Ergonomically shaped to fit your body in the cycling position. Clicks on and moves with you. • climaJet textile, a proprietary fabric developed in the ASSOS textile lab. Its unique characteristics include “transparency,” elasticity and increased water protection. • Special fabric and advanced tailoring techniques reduce or eliminate distractions from noisy rustling and flapping as speed increases. • Ventilated side and arm panels accelerate the evaporation process. 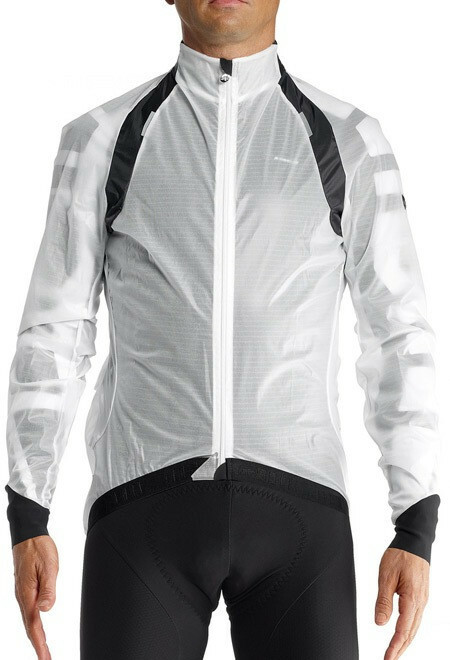 • ASSOS “pocket slots.” The lower rear panel of the climaSchutz features two openings cleverly positioned over your jersey / jacket pockets. Designed to serve not only as ventilation slots but also as access points to inner pockets without removal or excessive maneuvering of the jacket. • Rear panel emergency pocket. • Extended rear panel protects lower back from road spray and dirt. • Adjustable elastic “snuggies” at neck and wrist ensure proper insulation and stability. 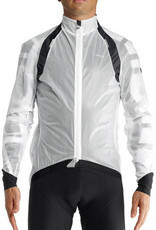 • “ASSOS easy entry system” for a faster, safer zippered closure. The climaSchutz vest and jacket shells are the ideal all-around insulation / protection solution for all- weather, all-season performance cycling. 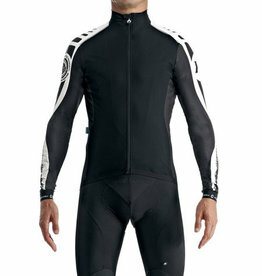 Engineered to be low volume, they exemplify the ASSOS goal: create purpose-driven garments that work!